My late grandfather called golf “cow pasture pool.” He made fun of city fellers who spent their weekends whacking a little white ball around a well-mowed pasture. My grandfather hated golf because he believed that it caused the creation of something else he hated— Daylight Savings Time. Unlike my grandfather, I once enjoyed playing cow pasture pool, particularly on summer nights when thanks to Daylight Savings Time, the sun was still shining at 8:00 p.m. which was actually 7:00 p.m. but we made it 8:00 p.m. by moving Mickey’s big hand forward on our watches. But I gave up cow pasture pool about 20 years ago for two simple reasons. First, I was tired of embarrassing myself by trying to play a game that is simply impossible. Just think for a moment what cow pasture pool is all about. You walk on to the cow pasture with a bag of sticks and balls. You then take one of the balls and put it on a very small stick, and then take out a longer stick from your bag of sticks and hit the ball in the direction of a very small hole that is located hundreds of yards away. The object of the game is to then hit the little ball with your stick into the little hole hundreds of yards away in no more than 3 to 4 swings of the stick. Let’s face it, folks. That’s an impossible feat. The second reason I gave up cow pasture pool was because I really wasn’t getting any exercise playing the game. Mark Twain once famously said that golf is “a good walk spoiled.” For me, it was a good ride spoiled. I always rode in golf carts across the cow pasture which meant that the only exercise I was getting was to climb out of the golf cart at least 100 times to swing one of my sticks at the little bitty ball. But while I quit playing cow pasture pool, I kept watching it on TV. I’m a sports couch potato who spends his weekends in his favorite lounge chair with the remote control channel changer gripped firmly in hand. On my home jumbotron, I watch baseball in the summer, football in the fall, and basketball in the winter. And I also watch cow pasture pool. Last Saturday, I was watching the telecast of the U.S. Cow Pasture Pool Open, when I saw my favorite pro-golfer, Phil “Lefty” Mickelson, do something I have never seen before in a cow pasture pool game. He missed a putt badly, but when the ball rolled past the cup, Lefty did not wait for it to stop. He raced to the other side of the green in the path of the moving golf ball and then, before it stopped, he swatted it back toward the hole. You read that right, Arnold Palmer-breath! Lefty turned cow pasture pool into field hockey! For a moment I thought Lefty had just lost his mind which is what I often did during moments of frustration back when I was playing cow pasture pool. But Lefty later told a TV interviewer that he intentionally played field hockey because the ball was about to roll off the green, and he was willing to take a 2-stroke penalty for hitting a moving ball. 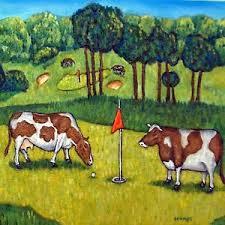 I never knew there was a 2-stoke penalty for hitting a moving ball in cow pasture pool. I never knew you could even hit a moving ball while playing cow pasture pool. There may be a whole bunch of other rules of cow pasture pool I am not aware of. For example, if you have a hole with a water hazard, and you are playing with a caddy, can you give your caddy a baseball glove and position him in front of the water to catch one of your shots before the ball goes into the water? When your ball lands in one of those cow pasture sand traps, can you make a little sand tee in the trap and position your ball on top of it? If you can play field hockey like Lefty did on a slippery green, can you take your putter and just push the ball toward the cup rather than slapping at a moving ball? If you can hit your ball while it is moving, can you swat an opponent’s moving ball if it is headed toward the cup? And if you can play field hockey in a cow pasture, can you not also play golf polo? You could just drive your golf cart down the cow pasture, lean out of the side of the cart, and slap your ball as you drive along! Now that would be a good ride unspoiled! Well, if you’ll excuse me, even though it’s approaching 9:00 p.m., I’m headed for the nearest mowed cow pasture. I’m going to rent a golf cart and load it up with balls and hockey sticks! Peggy: This is precisely why I don’t play “cow pasture pool!” I’m good at riding in the cart with an adult beverage while I watch Don avoid cow patties! !